To this day I’ve never had any desire to own a PS3, however once I saw the Beyond Two Souls trailer on TV that changed. I felt a sudden, almost intense urge to play that game. Now I know it’s received some mixed reviews, but I still really want to play the game. It may be simply that I love Ellen Page, but it could also be that I love adventure games. Indigo Prophecy was one of my favorite games on the original Xbox and interactive story games like Telltale’s The Walking Dead continue to be some of my favorite gameplay experiences. 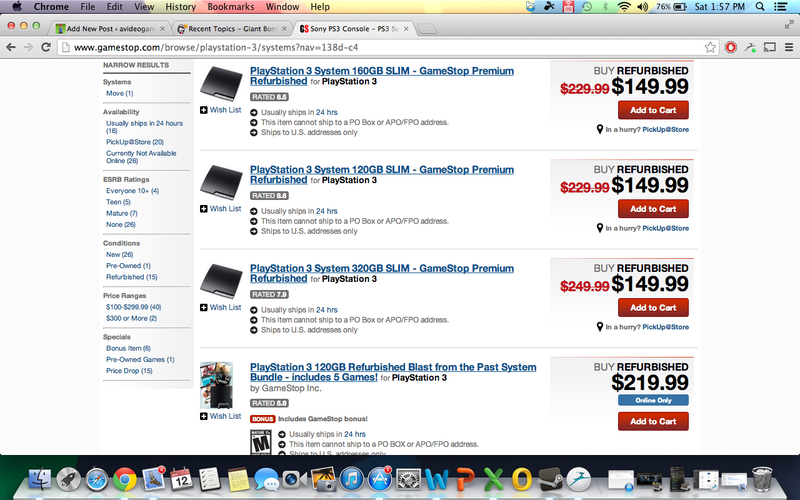 Therefore I was elated when I saw that Gamestop is selling all pre-owned PS3 models at $149 from now until the 24th of October (the original model 360 is selling for $99 and the slim is selling for $119 during that period as well). Unfortunately my budget won’t allow me to pick up a PS3 until the first of November pay period. Still, I may end up purchasing a PS3 to play through Heavy Rain and Beyond Two Souls in the near future. I’m not really interested in anything else the PS3 has to offer. I have a Blu-Ray player but almost never use it as I stream the majority of my movies in HD, or rent HD movies on demand via DISH. Hopefully you can take advantage of this sweet deal through Gamestop. It’s really the cheapest way to get a 120gb PS3, as the lowest I’ve seen a 60gb go for on Craigslist around here has been $135. This entry was posted in Video Games and tagged Beyond Two Souls, cheap, deals, GameStop, Heavy Rain, Indigo Prophecy, PS3, PS3 cheap, PS3 Gamestop, PS3 sale. Bookmark the permalink. Yeah, I definitely caved and ordered a 250gb Uncharted 3 bundle from the Bx…Who knows when it’ll arrive though, it’s showing an estimated ship date of 27 Oct… Hopefully it’ll get here sooner so I can check out Beyond Two Souls. A lot of PS3 owners are telling me it’s not worth playing, but I feel like it’s the perfect type of game for me. Until then I’ll play through Indigo Prophecy and The Wolf Among Us for my adventure fix.